As I said the other day when I posted Part 1 of the Hal Blaine tribute medley, I could go on and on (and on) but I had to stop somewhere. Blaine – who died on March 11 at the age of 90 – played on so many hit recordings (150 songs reached the Top Ten with 40 of them reaching #1) that posting them all could easily be a full-time gig, but I settled for a few of the artists he played with. The last song was the final recording ever made by Glen Campbell. 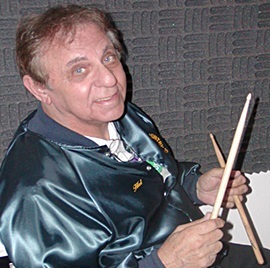 Joining him in the studio in January 2013 were his former Wrecking Crew bandmates; 75-year old pianist Don Randi, 75-year old bass guitarist Joe Osborn, and an 83-year old drummer named Hal Blaine. Another Saturday night and I ain’t got nobody but 18 yellow roses came today. I gave her all the love I had and I’ll break some rules cause I am hungry for the sweet life baby. My love is deeper that the deepest ocean, wider than the sky and we can fly, up, up and away in my beautiful balloon cause you are the one that I love. I just dropped in to see what condition my condition was in a long time ago. Love will keep us together cause something in your eye was so inviting for strangers in the night. All summer long we spend dancing in the sand cause it never rains in southern California. What I believe in and I run just like the wind. Sing a song of songs, shine, shine, shine now. I’m never gonna hold you like I did … I’m not gonna miss you. Can’t compete with Penny!! It is amazing how much this brings back such fond memories!! Not liking some of the new music out there!! Keep them coming Ray!! And yes we will miss you Hal! !